We can see that this utterance is made up of two clauses if we separate it into its ranks, as follows (Table 2). When two or more clauses combine to form a longer utterance, we refer to the new combination as a clause complex. Note that we are not referring to sentences here, as we are concerned with spoken language. Sentences are a phenomenon of written and not spoken language. In written texts, it is usually easy to identify sentences: they frequently begin with a capital letter and end with a full stop. Even so, there is no universal agreement as to how long or short a sentence may be. Writers, and editors of texts, tend to divide sentences into manageable sizes, usually influenced by the amount of information that they consider the reader will be able to retain whilst reading the sentence. In other words, the sentence is divided into semantic chunks, units of meaning that appear to convey a complete thought. There are, therefore, no commonly accepted rules that govern the structure of a written sentence. Similarly, there are no rules that prescribe how long a spoken utterance may be. One would suppose that similar cognitive constraints to processing written sentences would apply, i.e. the listener would be able to retain and process only so much information in the auditory memory. 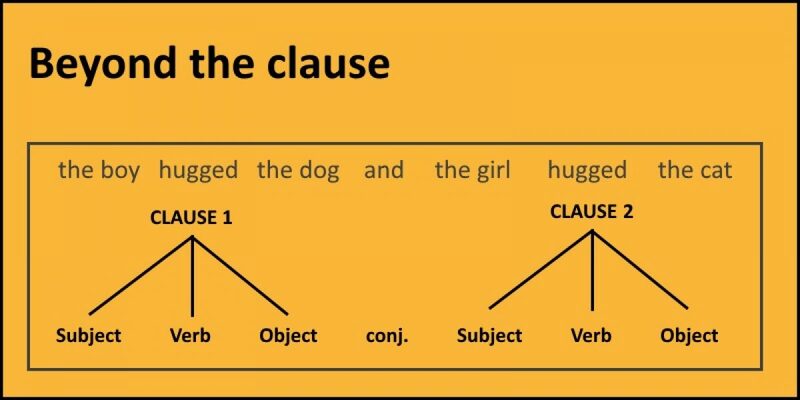 We can, nevertheless, identify ways in which various clauses may be combined with others. There are two main ways in which clauses may be combined: (1) coordination, and (2) subordination. Two independent clauses may be linked through the use of coordinating conjunctions such as and, or, but, then, e.g. We have already noted the two clauses (1) although Joyce played well, and (2) the standards were too high. The first of these is introduced by the subordinating conjunction although. It is also apparent that this clause cannot stand alone – it does not provide a complete thought. Rather, it is dependent upon the main clause the standards were too high and serves to provide background information. Other examples of subordinate clauses (in red) are as follows. Hewings, A. (2005) Describing the Grammar of Speech and Writing Milton Keynes: The Open University.